A guide to the Japanese underworld, Japanese pop-culture, yakuza and everything dark under the sun. War clouds threaten northeast Asia. One state within the region continues to raise its military spending to record levels over five consecutive years. It increases solid-fuel rocket testing under the guise of launching satellites into orbit and continues stockpiling vast reserves of plutonium that could potentially nuclear arm the nation. New domestic laws severely limit the media, and active discussion persists on bills that would crack down on socially unacceptable or controversial thinking—i.e., “thoughtcrime.” These ever-belligerent, destabilizing actions are not the actions of a rogue state. No, this isn’t about North Korea, Iran, or Russia for that matter, but the remilitarization of Japan. In May 2017, the Abe administration made its position known regarding the ban of wartime imperialist military flags in international soccer matches, expressing that imperial regalia does not necessarily connote imperialism and discriminatory opinions against neighboring nations—something akin to if Angela Merkel condoned the use of the Nazi Hakenkreuz for supporting the German national sports team as completely acceptable and lacking negative effect on spectators. 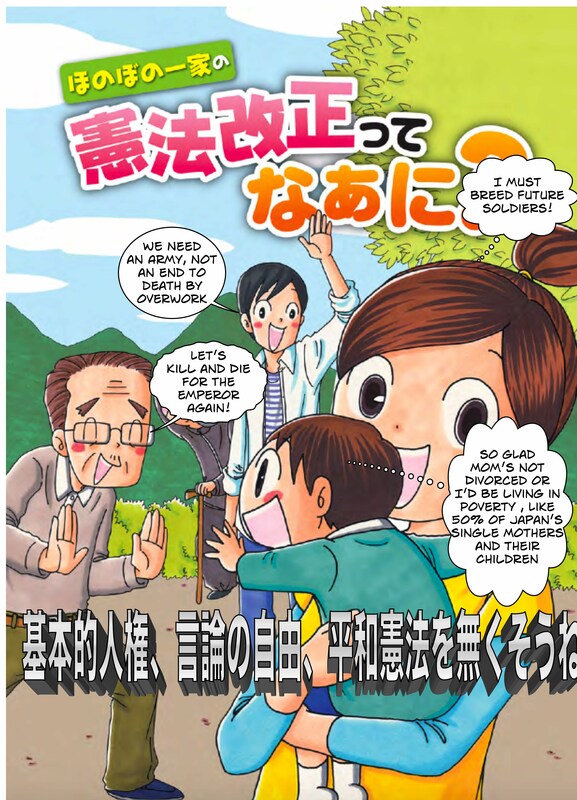 Abe’s Liberal Democratic Party has produced manga booklets to promote constitutional revisionism—for Japan to become a “normal country” as party members call it. Proponents of wholehearted constitutional revisionism claim that Japan is not a “normal country” due to the postwar U.S. occupation forcing the current national constitution upon the Japan. The Japanese establishment wields this tried-and-true tactic of using pop culture to foster understanding of its agenda among the public across many domains. The civilian nuclear energy programs of the 1950s were promoted through pop culture icons utilized by the then head of the Yomiuri Shimbun—and known CIA operative—Shoriki Matsutaro. This tactic continues to prop up the myth of nuclear safety in Japan, which played a disastrous role leading up to the Fukushima Daiichi disaster in 2011. The combination of propaganda and the incessant war drumming appears to be working. Recent survey data from late April collected by the nonpartisan Mainichi Shimbun newspaper showed that 48% of respondents agree to the proposed constitutional revisionism, whereas those against it consisted of only 33%. The numbers have steadily risen since the ruling party began openly discussing constitutional revision. Abe’s party and the Cabinet Legislative Bureau reinterpreted Article 9—the peace clause of Japan’s constitution that renounces war—to allow for collective self-defense in 2015. This move was a sharp reversal from the policy of individual self-defense and the constitutional interpretation that all previous administrations used to justify a reliance on the U.S. military as their defense policy and their relative reluctance toward international military cooperation. Whereas the aforementioned survey data claimed that 46% of respondents were against amending Article 9, one can but wonder whether the respondents based their responses on the current interpretation of the article, which justifies a self-defense force with tanks, aircraft carriers, and other offensive weaponry along with participating in foreign wars with the United States. The nationalists in the Japanese government had claimed for the last seventy-odd years that they needed to revise the constitution, as it did not allow them to have a full-fledged military. And yet ironically in the last two years, the government and media have promulgated a new claim that the renunciation of war in Article 9 does not prohibit the use of military force by Japan. If political actors can reinterpret long-standing constitutional interpretation on a whim like this, then wouldn’t it affect the perception of formally revising Article 9? “Rich nation, strong army” (fukoku-kyohei) was the nineteenth-century slogan the ruling elite used to rapidly industrialize in the advent of the Meiji period to protect national interests against Western colonial powers. It was also the slogan that led Japan to bolster its military and eventually steer the nation toward colonial expansion into Korea, China, and other neighboring nations. Fomented by both the international and domestic media, we are too often conditioned to pay attention to the most fashionable international threat of the week and yet are blind to actions occurring right before our eyes. Recent developments led by Abe’s administration eerily echo the prewar slogan, and we as members of the international community should view these events with extreme caution, as for all we know history may repeat itself. *Editor’s note: Prime Minister Shinzo Abe (2012-) had a grandfather was a war criminal, and served as Minister of Munitions during World War II–Nobusuke Kishi. Kishi raised Abe like his own son, and Abe’s stated desire to fulfil his grandfather’s dreams of dismantling the post-war constitution and restoring a State Shinto controlled Imperial government probably owes much to his childhood. But his childhood dreams could be a nightmare for a democratic Japan. Douglas Miller is a PhD Candidate at the Henry M. Jackson School of International Studies, University of Washington. His primary focuses are political theory and Japanese history. The part about Japan being not a ‘normal’ country because of the constitution established post-war reminds me of the German Reichsbürgerbewegung ( https://en.wikipedia.org/wiki/Reichsb%C3%BCrgerbewegung ), a group that among other things claims that Germany is not a sovereign country, is still occupied by the USA and is nothing more but a company run by the USA and it’s citizens are just it’s employees. Big (and scary) difference is, that in Japan those people are actually in parliament and influencing lawmaking, whilst in Germany it’s ‘just’ a group of a few thousand nutjobs, but they have the tendency to directly pose a threat to other people. There were several cases of police officers being shot by Reichsbürger when they came to enforce search warrants. That is really fascinating. Thank you! We will use that in a future article. Kishi was never charged or indicted let alone tried as a war criminal. 失敗だったな。He was arrested as one. It’s a shame he wasn’t tried and executed. Next Next post: UPDATE: Oh Lucy! A darkly funny movie that asks: Can learning English in Japan change a woman’s life? The answer…..